In the Los Angeles Times this week, production designer Guy Hendrix Dyas has written an interesting essay about Christopher Nolan, with whom he collaborated on “Inception.” (Dyas, a Brit who was production designer for “X2,” “Superman Returns,” and “Indiana Jones and the Kingdom of the Crystal Skull” before “Inception,” is currently working with Steven Spielberg on “Robopocalypse.”) The story is a fascinating glimpse behind the curtain of movie magic — in which he emphasizes that Nolan, unlike many young directors, doesn’t just rely on the newest technology to create a special effect. “He knows that anything you notice as a digital effect will remind you that what you’re watching isn’t real,” writes Dyas. When we first discussed creating one of our action sequences, a freight train smashing its way through a busy street, he looked at us with his icy blue eyes and calmly said, “We’re going to shoot this practically and we need to figure out how we’re going to do it in the streets of Los Angeles.” At that moment, and to my great delight, I realized that Chris is unlike most young directors working in Hollywood today. He still believes that the best way to achieve realism and get great performances from his actors is by trying to shoot everything upfront, even if it means challenging his shooting crew on a day to day basis and being open to the idea of using older set building techniques and special effects. 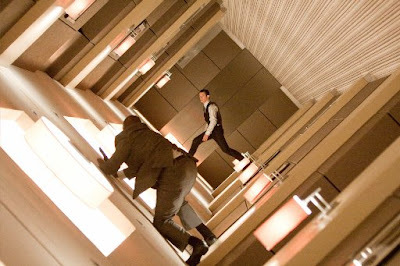 Turns out that many of the elaborate shots in “Inception” had a basis in reality, rather than being created on a computer — and some used tricks as simple as using 90-degree mirrors in the hotel hallway for the floating fight scenes, to make the hallway look longer. “It’s great to be given the ability to work from reality whenever possible,” Dyas writes, “and Chris reminds us that what matters most is creating an illusion, not the artifice or device that makes it happen.” A good read; do check it out if you have a minute.